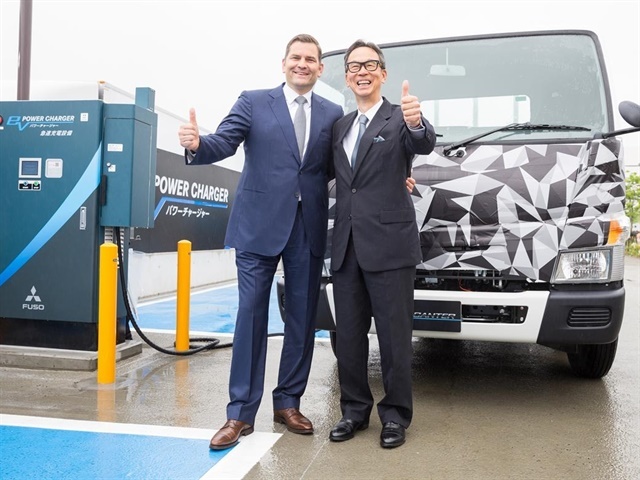 Mitsubishi Fuso Truck and Bus Corporation (MFTBC) inaugurated the first public power charging station dedicated to trucks in Japan, directly outside its Kawasaki manufacturing facility in the presence of media and guests from the Japanese Government and local Kawasaki Administration. The move comes in preparation for the launch of the all-electric FUSO eCanter later this year that will be the first series-produced electric truck sold in the market by an established automotive brand. Similar preparations are occurring in other key countries, including the United States, an important growth market for FUSO. The “FUSO EV power charger” consists of eight chargers in two locations, which provide DC 50-500 Volt, 125 Ampere via CHAdeMO, and CHAdeMO Compo charging plugs. It is capable of rapidly charging up to eight electric trucks (or passenger cars) simultaneously, and will be open for public use. Participating in the event as honorary guests, Director General of METI, Toshihide Kasutani, and Mayor of Kawasaki City, Norihiko Fukuda, welcomed the initiative of Mitsubishi Fuso. Related: Mitsubishi Fuso Bringing Electric eCanter to U.S.